The dark red of mighty castle walls that loom over the city and the surrounding countryside. The interplay of stone and light on the gothic architecture. Vestiges of the Moorish presence in the city's history. Streets of white houses that reflect the sun and the blue sky. Herein lies the appeal of Silves where the past merges with the present. Silves retains much of its former charm in the streets of the old 'almedina', which are still laid out as they were in medieval times. The buildings that extend from the city walls to the river are, in many cases fine examples of the bourgeois architecture of the end of the 29th century and the early decades of the 20th testimony, to the new prosperity brought by the cork business. Much of the city's past can be glimpsed to this day in the patterns of its streets and its architecture. The Jewish quarter was situated between R. das Portas de Loulé and what is nowadays the parish hall, while the synagogue was outside the city Walls. Built out of the region's fine red sandstone possibly on the site of the old mosque, it was begun in the 2nd half of the 13th century or the beginning of the 14th. Work continued into the middle of the 15th century after part of the structure collapsed. The main facade is dominated by the Gothic doorway spanned by a backdrop which ends in a veranda held up by corbels with gargoyles. The only other elements surviving from the original building are the circular window and the two buttresses, as the rest of the facade and the towers are baroque. 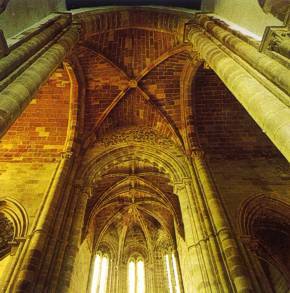 The interior consists of three naves, with plain pillars and ogival arches. The beauty, of the transept and the apse makes them a good example of gothic art. The main chapel is flanked by recesses with a ribbed vault. On the main altar is a statue in jasper of the Our Lady with the Infant Jesus. On the floor are headstones; one of which denotes the former resting place of King João II (1455-1495). This building dates from the 16th century and its Manueline origins are apparent from a highly decorated side doorway positioned above ground level, which was possibly the former entrance to the church. The main facade has a portico of classical design. The interior consists of a single nave. The main chapel has a ribbed vault and a Renaissance retable (16th century) with paintings from a later period. The church has a collection of mercy banners that are still used in processions. Located outside the old city walls, it was built initially in the 12th century to receive the remains of the Portuguese soldiers and crusaders who died during the first campaign to conquer Silves. It was rebuilt in the 16th century and again later in the 18th. The main facade is in the baroque style while the denticulate decoration in the main chapel belongs to the Manueline period (16th century). The main chapel has a painted vault finished with Crosses of Christ and religious and military symbol. There is a 16th century retable. The chapel also contains two caned and gilded tables originally from the Cathedral (18th century). 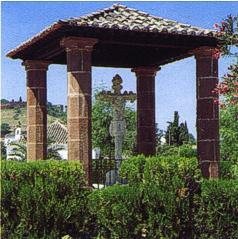 A symbol of municipal power, this stone monument has been rebuilt from 16th century remains. 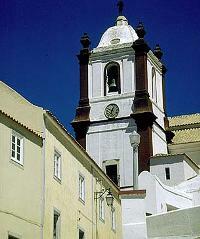 Commonly found in towns elsewhere in Portugal, it is the only such structure in the whole of the Algarve. Located next to the old road that used to constitute the link with the north and with the kingdom of Portugal (whence perhaps it takes its name), the exact date of its construction is not known (15th century or beginning of the 16th century. It is one of the most beautiful cross in Portugal and has on one side a representation of the crucifixion and on the other the Mater Dolorosa. The base dates from 1824. 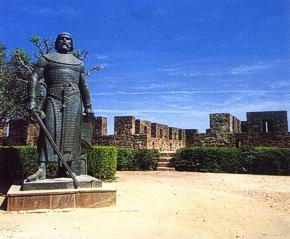 The biggest castle in the Algarve and the most beautiful military monument to the Islamic period in Portugal. It has its origins in the ramparts built around the town during the Moorish occupation, probably on the site of late Roman or Visagothic fortifications (4th /5th centuries). Its eleven towers, two of which are barbicans - joined to the ramparts by a supporting arch that holds up the walk way - and thick walls enclose an area of approximately 12,000 m2. The double entrance is gateway defended by two towers and the opening of the `traitors' gate in the north facing walls still remains. Four of the towers have gothic doorways, vaulted halls a stones bearing the marks of medieval masons. 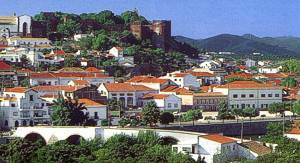 According to a description left by a crusader who took part in the conquest of Silves, the town's defences consisted in addition to the castle, three lines of ramparts. All that remains of these defensive walls are a few stretches built of red sandstone and taipa and a number of towers which once protected the residential area "almedina" of Silves. 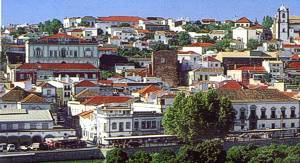 Of the four gates to the almedina all that remains is the Torreão da Porta da Cidade (the Turret of the City Gate). This consists of a barbican built in the 12th or 13th century which gives access, by way of two corridors, to the city. Inside the tower are two rooms and annexes which were for centuries the home of the Municipal Council. Dating back to the Medieval period, until only a few years ago it was this structure that connected Silves to the coast. With its back to a section of the city ramparts, this building contains a well of Moorish origin (11th century) dressed with stone and 'taipa" that is approx. 60 feet deep and 8.5 feet across. Steps lead in a spiral down to the bottom. The well was blocked up in the 16th century and the house which now contains the museum was built over it. 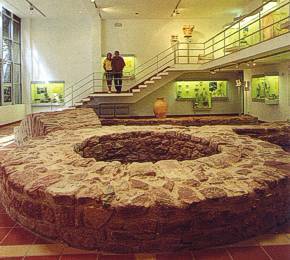 The museum's collections include archaeological finds from throughout the municipality, including a particularly interesting collection of Moorish ceramics from digs conducted at the castle.